Probably a decade ago, I brought home a containerized tree, probably from a Secrest Arboretum Plant Discovery Day sale, perhaps as a gift from a friend. It was neglected in its container at the side of our house in northeast Ohio until my wife elbowed me into planting it on a day with little time and I stuck it a few feet away near some old spruce trees. I mostly forgot about it, maybe once a year wondering if this was a volunteer that had sprouted up or if I had planted it, until last year, at about 15 feet tall (yes, I am that unobservant and lazy), when I noticed this tree’s yellow flowers, on this tree’s not yet spectacular panicles. From the movie…In the middle of the swamp, there lives a tree….in Raintree County, “which had no boundaries in time and space, where lurked musical and strange names and mythical and lost peoples, and which was itself only a name musical and strange”, there lives the goldenrain tree. 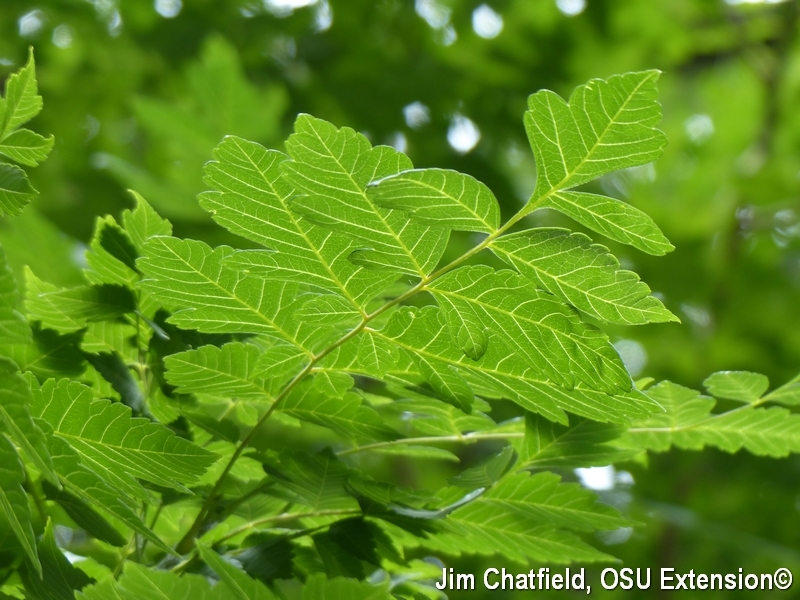 So, it is a goldenraintree (Koelreuteria paniculata) in my yard and it is a good specimen tree for Ohio, sometimes also used as a street tree, though considered too messy by many once the papery fruits brown up as we move into fall. The golden flowers are lovely, though the legend that all fall in love who sit beneath the tree where golden blossoms fall is probably only Hollywood legend. And that is the rest of the story: “Golden Raintree” was a 1948 novel by Ross Lockridge Jr., and a 1957 movie starring Elizabeth Taylor, Montgomery Clift, Eva Marie Saint, Rod Taylor, and to delight true Trekkie historians: DeForest Kelley. It is a story of a professor in Civil War Indiana (based on Henry County) falling in love amid times of turmoil. As for the tree, golden raintree is a medium-sized tree, growing to about 30-40 feet over the years, with those lovely sunny yellow flower panicles. The tree form is densely rounded, though it is quite upright in my landscape, possibly due to competition for light where I stuck it, or possibly because it is the cultivar ‘Fastigiata’. It has good drought tolerance, alkaline soil and pollution tolerance, and grows well in both swamps and urban sites. It blooms in July, but the ‘September’ cultivar, a great example of which is to be found in Spring Grove Arboretum in Cincinnati blooms forth on Labor Day.